Few sectors invite near-universal consensus like ecommerce. Digitalization has impacted every area of our lives, so it’s only natural that investors are bullish for online retail. That said, individual names like Wayfair (NYSE:W) invite robust debate. After soaring to dramatic heights this year, people unsurprisingly have questioned the longer-term viability of Wayfair stock. At first glance, the enthusiasm appears well-justified. Recently, management delivered a better-than-expected earnings report, paring expected earnings losses of $1.28 a share with $1.12 per share. Further, management rang up revenues of $2.01 billion, exceeding consensus estimates calling for $1.97 billion. Notably, this represented a nearly 40% lift against the year-ago quarter. Following the report, the W stock price gapped up to just under $150, or a 28% profit against the prior day’s session. Of course, that pleased me to no end. Earlier this year, I put Wayfair stock at the top of my list of publicly-traded companies to buy for 2019. Year-to-date, shares are up over 92%. It’s an unbelievable result, but that also raises the question: is this sustainable? You’re not the only one asking. Analysts from Wells Fargo (NYSE:WFC) warned that the W stock price has gotten ahead of itself. Citing risk factors such as an expected profit downturn in Q1, low brand visibility, and widening international losses, the premium has turned excessive. Additionally, the latest Q4 earnings report had the feeling of avoiding a bullet as opposed to producing purely substantive numbers. For example, management warned in November 2018 that it could face holiday profitability pressures. This dark forecast stemmed from possible price cuts to stay competitive, as well as spikes in advertising expenses. Neither headwind showed up, which probably caused a “relief rally” effect in Wayfair stock. But is that enough to justify taking a shot here? When I wrote about the home-furnishings specialist earlier, I focused on its longer-term potential. 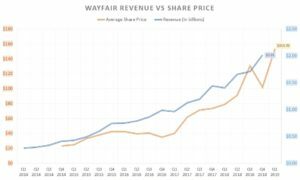 Despite some fiscal challenges, the fundamental shift from traditional commerce to e-commerce significantly benefits Wayfair stock. Largely, the free markets have priced shares fairly. In Q4 2014, the company generated $408.6 million in top-line sales. As I mentioned earlier, in four years’ time, that figure jumped to slightly over $2 billion. During this timeframe, the W stock price skyrocketed from an average $23.07 to $102.19. Mathematically, this relationship between revenue and market value translates to a 92% correlation. In other words, as sales rise, so too does W stock. 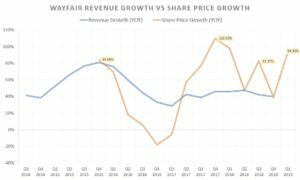 More important, Wayfair’s year-over-year revenue growth is very consistent. In the previously-mentioned period, average sales growth is 50.2%. As you can see from Q4’s YOY growth of 40%, this metric has slipped, but only by a little. Plus, sales growth when Wayfair revenues were in the sub-billion category was 54.5%. After sales breached the billion-dollar mark, growth is still a very healthy 43.4%. Despite working against the law of large numbers, the company still brings home the goods. So why should investors, and especially prospective buyers be concerned right now? Because the market premium for Wayfair is unfair. During the company’s sub-billion sales quarters, YOY growth in the W stock price averaged 26%. But during the plus-billion quarters, this metric jumped to 73%. Put another way, you’re paying substantially higher premiums for lesser growth. But the kicker is the recent spike in Wayfair stock. So far this quarter, shares are up almost 95% from the year-ago period. Based on historical trends, the company has been unable to sustain such lopsided premiums for its equity. Although I like the company longer-term, I don’t think anything is going to change here. If you received a nice profit already on paper, this is a great time to capture those gains. You can refer to my analysis above. However, you can also rely on common sense: shares that zoom over 90% in less than three months usually correct sharply. If you’re considering a position in Wayfair stock, do it, but don’t do it now. Not only have shares gotten technically overheated, they’ve demonstrated wild trading in recent years. But once some of this looney-tunes valuation fades, I like W stock for the long haul. Amazon (NASDAQ:AMZN) has consistently demonstrated disruptive nature of ecommerce. While Wayfair is no Amazon, it has the potential to do the same for its core market. But like I said, I’d just wait for a more favorable entry point. 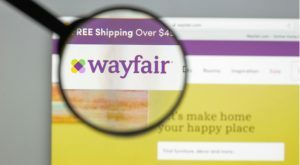 Article printed from InvestorPlace Media, https://investorplace.com/2019/03/lock-in-your-wayfair-stock-profits/.